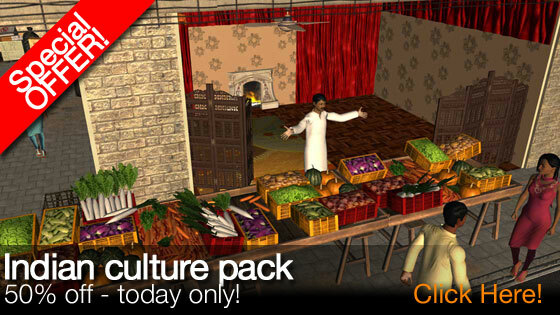 Special offer - today only - Get the Indian Culture pack for just 200MSP! Add a bit of Indian Culture to your movies in the form of a traditional Indian taxi, road signs and textures, props for your interiors and some authentic Indian costumes. Thereâ€™s an intricate fireplace, privacy screen and ceiling fan for your house interiors, a road and pavement texture (along with kerbstones to separate them), plus a selection of market stalls and telephone/ power cables to dress your streets. Both costumes (a pajami for your female characters and a kurta for the males) have pattern variations and, as usual, thereâ€™s a version of each that you can tint to any colour. I just posted this to my Facebook page. Great that you are having these sales as it really helps new users obtain the addons. Because I already have a rented licence its not letting me buy it.. I want it. I really like it too. "move along, nothing to see here; these are not the droids you are looking for..."
I have this pack, i bought it but it has many items missing which actually indian theme should have. when i asked one of the professional artists here to create additional mods, i got a sky high rate (around 100 USD plus) which i could not afford. i wanted a indian saree, some jewellery, red dot and some other indian mankeup and decoration stuff which can make indian theme movie realistic. I hope someone will create mods and add into this pack to make it more complete. arv9876, there are users who are really good at creating costumes, Shirley Martin is one of them and she doesn't charge very much to do this so I would send her a message and ask her to create some more Indian costumes. Her user name here is Squirrleygirl. Yes i did contacted her but the cost what i got for getting a indian saree with jewellery was way too high (100 USD Approx.) for a person like me who just use moviestorm as a hobby and no intention of making any money out of it. I have found a google sketchup for saree as well on internet free but i was not able to import it into moviestorm, i get error in import. here is the link, any one want to try and import? wish someday moviestorm will have feature to import characters if we buy from renderosity, good for moniestorm as well because more revenue .i would love to have a character like this in indian culture pack. That does seem a bit high but you have to look at it this way, modders charge according to how much time it takes to make an item. The more time they have to spend making things for special requests, the less time they have for everything else they do. Some mods are done for free but other mods, due to the complexities, are time consuming. If a modder decides this is something a lot of people would want, they might do it for a lower cost and then also sell it to the public. Did you state this was for your personal use only or did you give her the option of releasing the mod for others to purchase? That could also dictate the price. Harb is right. I charge for the time it takes. Making a costume is not a quick process. At least, not for me because I don't have a lot of experience doing it. It's not just making the costume either, it's re-skinning it to the Moviestorm skeleton. There are a few ways to make costumes and, as I said I'm not very experienced, but it's very time consuming. I'm pretty sure I gave you Chris' contact info at Moddingstorm because I usually refer people to him first for costumes because he has a lot more experience than I do. Squirrelygirl RIGHT! that's a bargain!! I know from spending hours trying to create modds with no success.